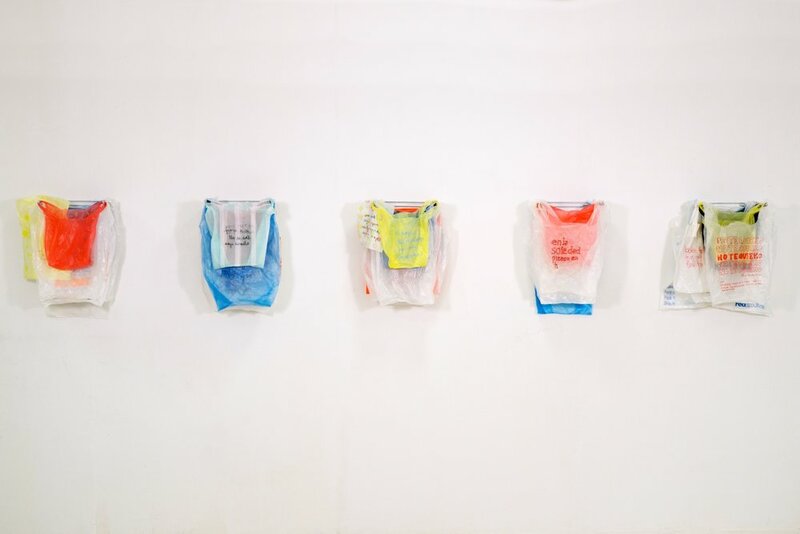 Made at University of Texas at El Paso in bricolage(assemblage)/mixed media, embroidered found plastic bags hanging on grocery store plastic bag dispensers, 10x2 feet, 2016. 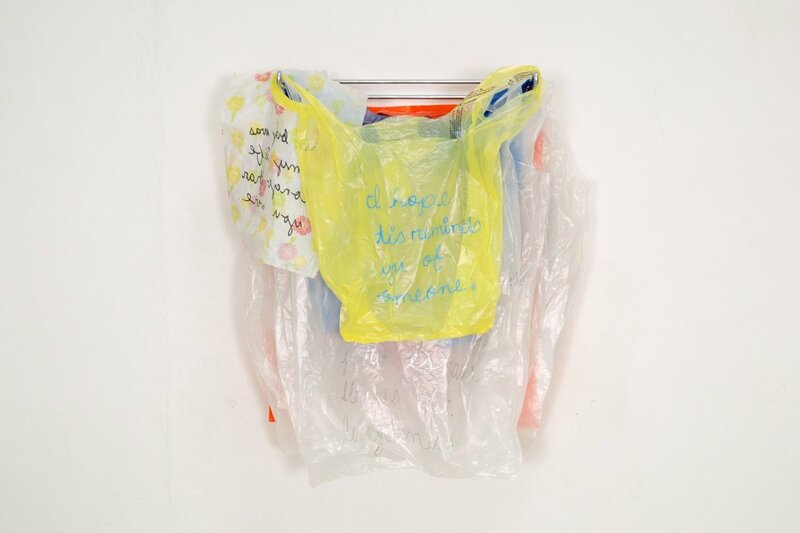 Made at University of Texas at El Paso in bricolage(assemblage)/mixed media, (detail) embroidered found plastic bags hanging on grocery store plastic bag dispensers, 10x2 feet, 2016. Made at University of Texas at El Paso in Introductory Sculpture, newspaper advertisements draped over dress model, 6x3x4 feet, 2015. 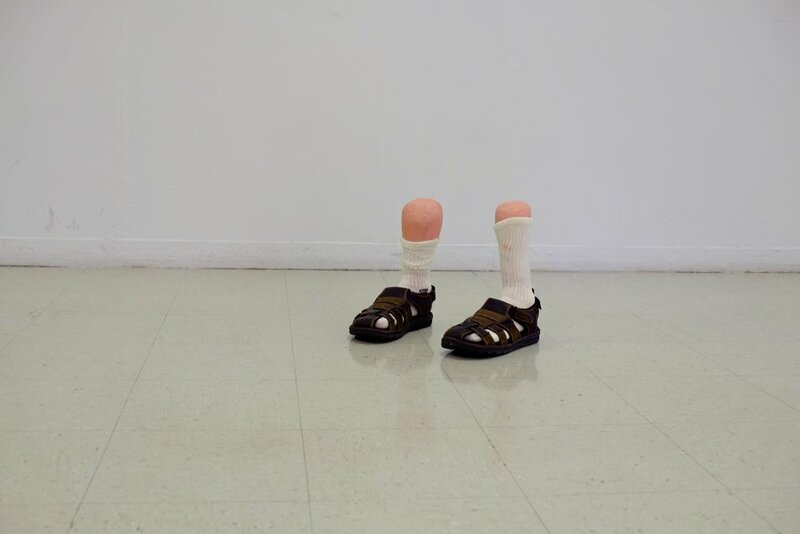 Made at University of Texas at El Paso in Introductory Sculpture, plaster cast feet with socks and sandals, 12x12x18 inches, 2015. 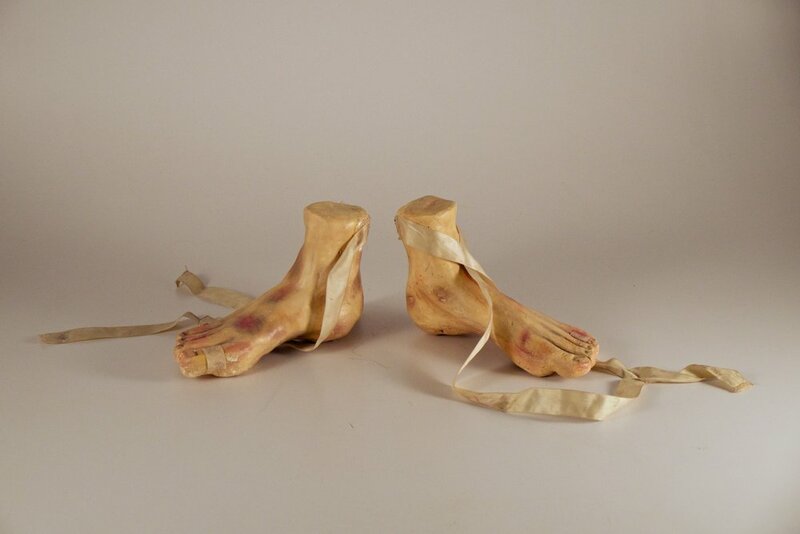 Made at University of Texas at El Paso in Introductory Sculpture, plaster cast feet painted with acrylic paints wrapped with ballet tape, 12x12x18 inches, 2015. 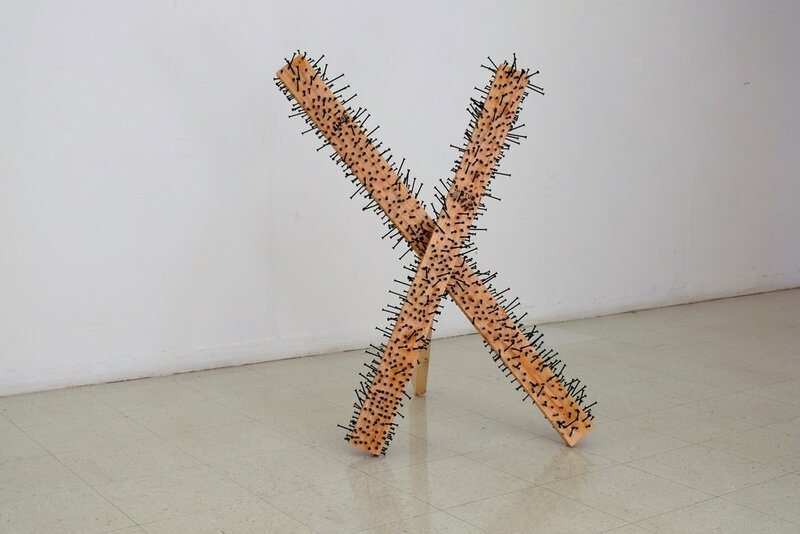 Made at University of Texas at El Paso in Introductory Sculpture, single 2x4 and 1,000 screws, 36x36x36 inches, 2016. Made at University of Texas at El Paso in 2-Dimensional Design, collaged magazines, 6x6 inches, 2015. 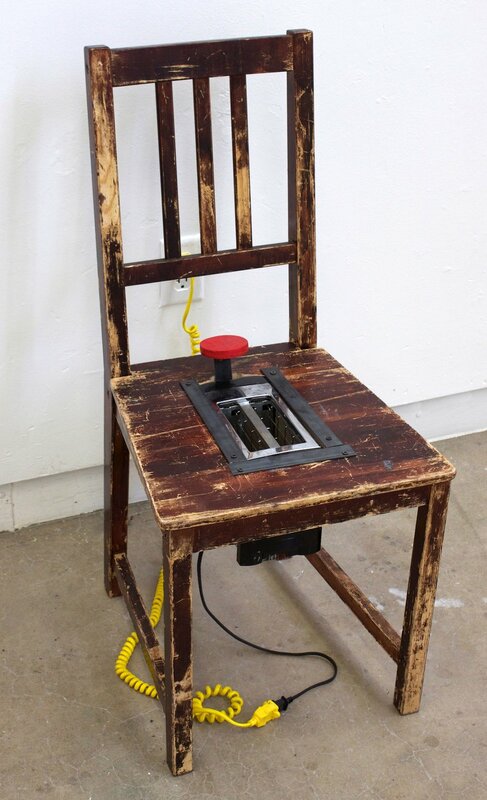 Made at University of Oregon in Wood and Everyday Materials, found chair with toaster embedded in seat, 36x18x18 inches, 2014. 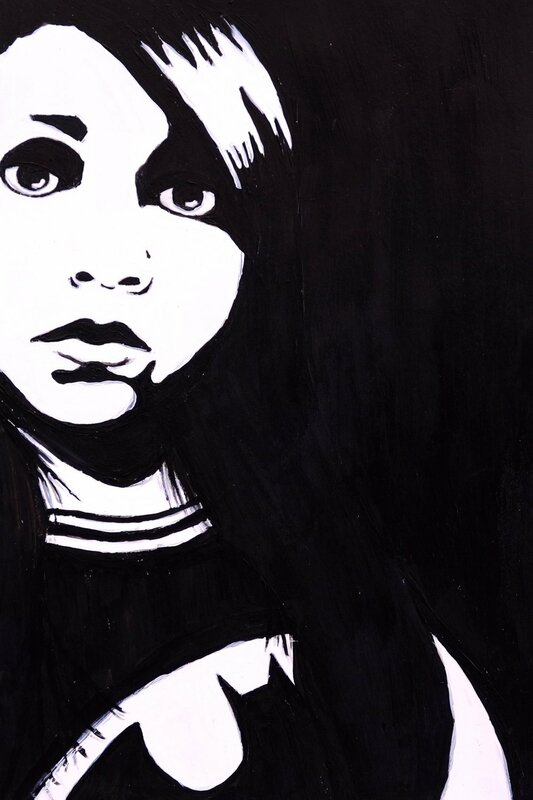 Made at University of Texas at El Paso in 2-Dimensional Design, acrylic paints on paper, 12x18 inches, 2015. Made at University of Texas at El Paso in 3-Dimensional Design, found paper shopping bags sewn together, 20x12 feet, 2015. Made at University of Texas at El Paso in 3-Dimensional Design, carved plaster and acrylic paints, 10x3x4 inches, 2015. Made at Edmonds Community College in Drawing 1, pencil on paper, 24x36 inches, 2016. 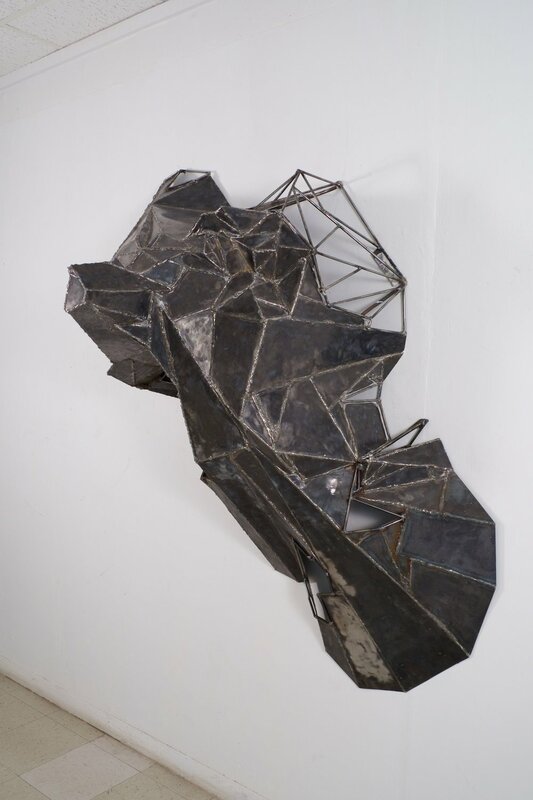 Made at University of Texas at El Paso in Introductory Sculpture, welded steel mountain form, 6x4x3 feet, 2016. Made at University of Texas at El Paso in bricolage(assemblage)/mixed media, collage, 12x8 inches, 2016. Made at University of Texas at El Paso in bricolage(assemblage)/mixed media, trash found at illegal dump sites, 12x8 inches, 2016. 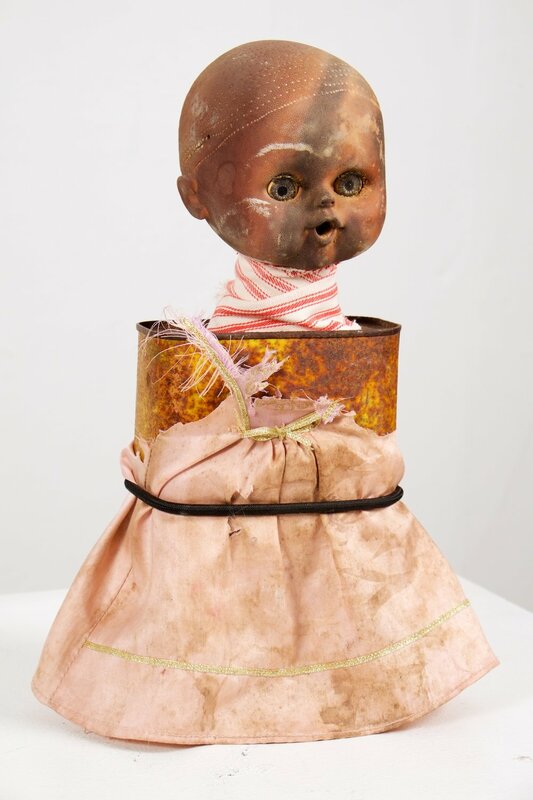 Made at University of Texas at El Paso in bricolage(assemblage)/mixed media, trash found at illegal dump sites, 12x8x6 inches, 2016. 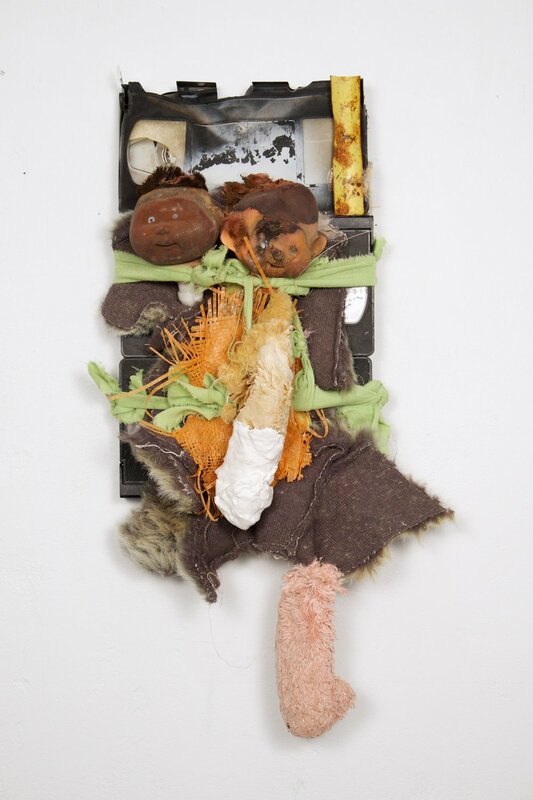 Made at University of Texas at El Paso in bricolage(assemblage)/mixed media, trash found at illegal dump sites, 12x8x10 inches, 2016.